THERE has been plenty of action in the opening round of the Champions League. We bring you all the highlights and results from Inter Milan v Tottenham, Barcelona v PSV, Liverpool v PSG, Monaco v Atletico Madrid, Club Brugge v Dortmund, Schalke 04 v Porto, Red Star Belgrade v Napoli, and Galatasaray v Lokomotiv Moscow. A STUNNING Mauro Icardi volley sparked a stunning late Inter Milan comeback as the Italian side beat Tottenham 2-1 on their return to the Champions League after a seven-year absence on Tuesday. ROBERTO Firmino struck a stoppage-time winner as Liverpool beat Paris St Germain 3-2 at Anfield after Kylian Mbappe looked to have secured a point for the French side in a compelling Champions League Group C clash. PSG had come back from two goals down with Mbappe equalising in the 83rd minute, but then Firmino, who started on the bench due to an eye injury, drilled home a low shot in the final seconds. Daniel Sturridge, in for Firmino, had opened the scoring for an impressive Liverpool in the 30th minute with a fine header from an Andy Robertson cross. Six minutes later last season's Champions League runners-up doubled their lead when PSG defender Juan Bernat tripped Georginio Wijnaldum in the area and James Milner slotted home the penalty. The Parisians got themselves back into the game though five minutes before the break when Robertson failed to clear and Thomas Meunier drove home a first-time effort. Then Mbappe stunned the raucous Anfield crowd with a clinical finish only to see Firmino grab the glory. 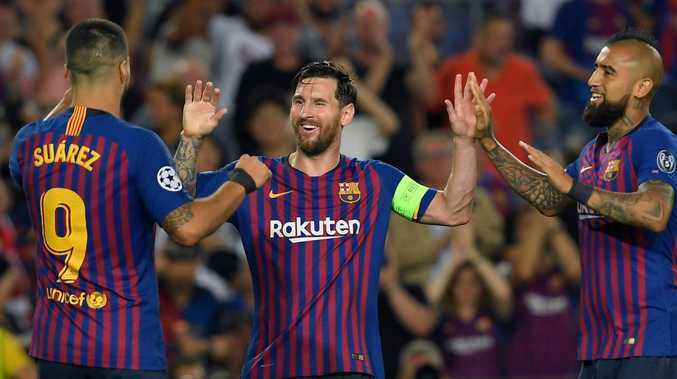 LIONEL Messi scored a hat trick to help Barcelona open its Champions League campaign with a 4-0 win over PSV Eindhoven on Tuesday. Ousmane Dembele also scored for Barcelona, which was already 3-0 up when it was reduced to 10 men as defender Samuel Umtiti was sent off with a second yellow card for a hard foul in the 79th. Messi's first goal came with a beautiful free kick in the 32nd minute at Camp Nou Stadium. He curled the ball over the PSV wall from 25 meters (yards) out into the top corner beyond the reach of goalkeeper Jeroen Zoet. Dembele added to the lead with a well-placed shot from outside the area in the 75th, and Messi sealed the victory with goals in the 77th and 87th minutes. Umtiti was sent off after a foul on PSV forward Hirving Lozano while trying to stop a breakaway. The Group B result extended Barcelona's unbeaten run at home to 27 matches in UEFA competitions. The Catalan club has won 25 matches and drawn only two during the streak. PSV, back in the Champions League after a one-year absence, is winless in seven matches at the group stage of the European competition. MONACO started its Champions League campaign with yet another home defeat, losing 2-1 to Atletico Madrid on Tuesday. 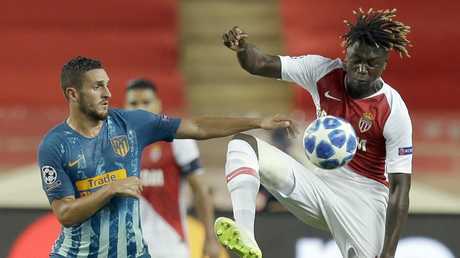 After losing all three home games in the group stage last season, Leonardo Jardim's side grabbed an early lead against the run of the play with a goal from Champions League debutant Samuel Grandsir. However, Atletico dominated for long spells and struck back before the interval through goals from Diego Costa and Jose Gimenez. The visitors had the stronger start and dominated with a high press that suffocated Monaco in the early stages. Costa came close of opening the scoring after only six minutes following a combination with Antoine Griezmann, but his curled shot ended just wide of Diego Benaglio's post. Grandsir's pace and runs caused some trouble, though, and he took advantage of a lapse of concentration in Atletico's back four to break the deadlock. Djibril Sidibe launched the move down the right flank and crossed for Radamel Falcao, who ran into the box and found Grandsir with a cutback pass that created panic in the area. Angel Correa and Saul Niguez could not clear the ball and the 22-year-old winger slotted home from close range with his right foot. Atletico pushed hard for an equalizer and was rewarded after a string of one- touch passes culminated in Costa's goal in the 32nd minute. Griezmann provided the assist with a subtle pass near the edge of the box that Costa collected before beating Benaglio. Atletico dominated the remainder of the first half and took the lead from a corner just before the interval as Gimenez jumped higher than Falcao and Kevin N'Doram score with a powerful header. GALATASARAY returned to the Champions League in style on Tuesday, beating Lokomotiv Moscow 3-0. After spending two seasons outside Europe's premier club competition, the Turkish champion beat its Russian counterpart with high-tempo tactics and swift counterattacks in the Group D game. Garry Rodrigues gave Galatasaray the lead in the ninth minute with a low hard shot from just outside the penalty area. Lokomotiv keeper Guilherme got a hand to the ball, but couldn't stop it. Eren Derdiyok doubled Galatasaray's lead in the 67th when he curled a free kick around the Lokomotiv wall. Only Guilherme's outstretched hand stopped Rodrigues making it 3-0 on a breakaway in the 75th. Galatasaray midfielder Badou Ndiaye was sent off in the 87th after earning a second yellow card for a late tackle on Anton Miranchuk. Selcuk Inan scored Galatasaray's third from the penalty spot in stoppage time after Guilherme brought down Emre Akbaba on a counterattack. 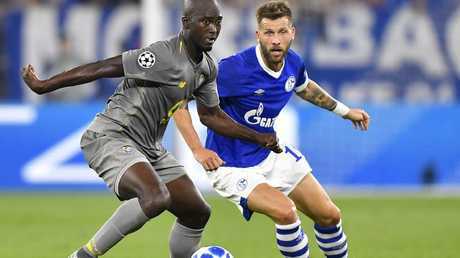 Porto and Schalke drew 1-1 in the other game in Group D.
RED Star Belgrade used a bit of luck to come away with a point against Napoli in its long-awaited return to the Champions League on Tuesday as it held the Italian club to a 0-0 draw. Napoli forward Lorenzo Insigne hit the crossbar early on, Red Star goalkeeper Milan Borjan did well to stop an effort from Arkadiusz Milik, and defender Milan Rodic cleared an attempt from Napoli's Jose Callejon off the line midway through the second half. In the other Group C game, Liverpool beat Paris Saint-Germain 3-2. Red Star was making its first appearance in the Champions League group stage, having last played in the European Cup group in 1991 as holders. The Serbian champion came through four qualifying rounds to reach the group stage. Napoli was last season's Serie A runner-up. CHRISTIAN Pulisic celebrated his birthday by scoring on his return from injury to give Borussia Dortmund a late 1-0 win at Club Brugge in the Champions League on Tuesday. The 20-year-old American, who hadn't played since Aug. 26 due to muscular problems, came on with around 20 minutes remaining and scored in the 85th when Matej Mitrovic's attempted clearance rebounded off his shin and looped in over Brugge goalkeeper Karlo Letica. Pulisic had missed two Bundesliga games for Dortmund and the U.S. friendlies against Brazil and Mexico. Mario Goetze made a rare start for Dortmund but was unable to provide much of a spark against the spirited hosts. Brugge was back in the Champions League group stage after a 13-year absence and created the better chances before Pulisic's goal. SCHALKE goalkeeper Ralf Faehrmann saved one penalty but was beaten by another as Porto salvaged a 1-1 draw in their Champions League-opening game on Tuesday. Brazilian midfielder Otavio scored the equalizing penalty with 15 minutes remaining, despite complaints from the home side that Moussa Marega fell under minimal contact from Naldo. The Schalke defender was also at fault for the first penalty after a hand-ball in the 12th minute. However, Faehrmann guessed correctly, diving to the right to push Alex Telles' spot kick around the post. Schalke's Breel Embolo put his team ahead in the 64th, slotting the ball inside the far post after some good work from Nabil Bentaleb and Weston McKennie. But the home side was left ruing referee Jesus Gil Manzano's decision to award the second penalty.